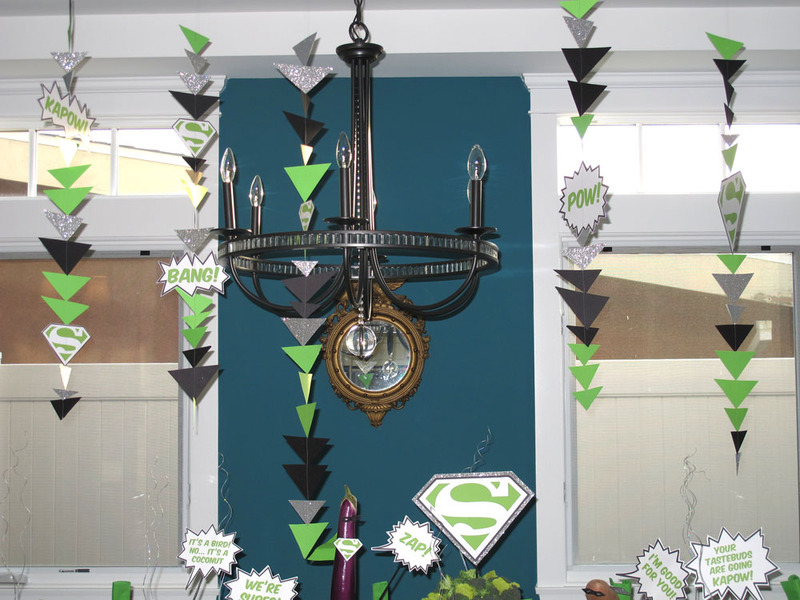 I’m sure you’ve all seen some really incredible superhero kid’s parties in the party-blogosphere. Like mind-blowingly amazing parties. This is not one of those. 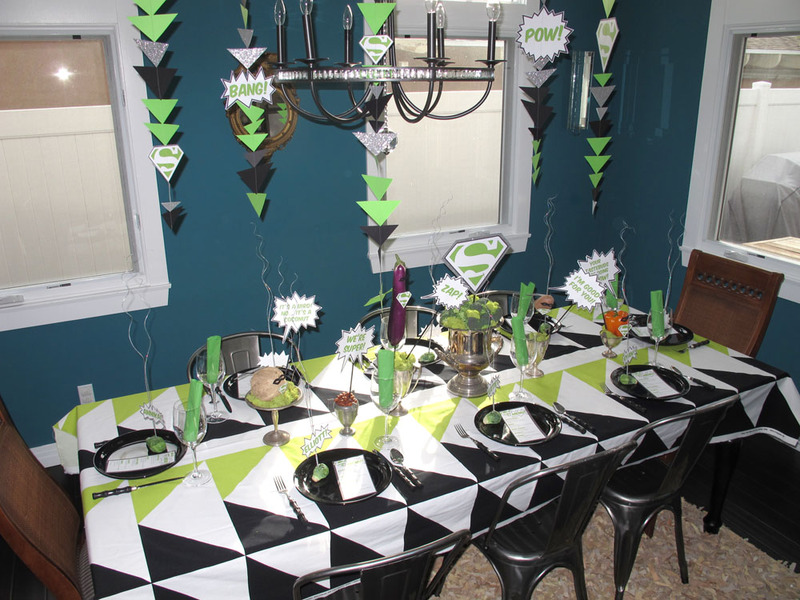 This isn’t even a kid’s party. 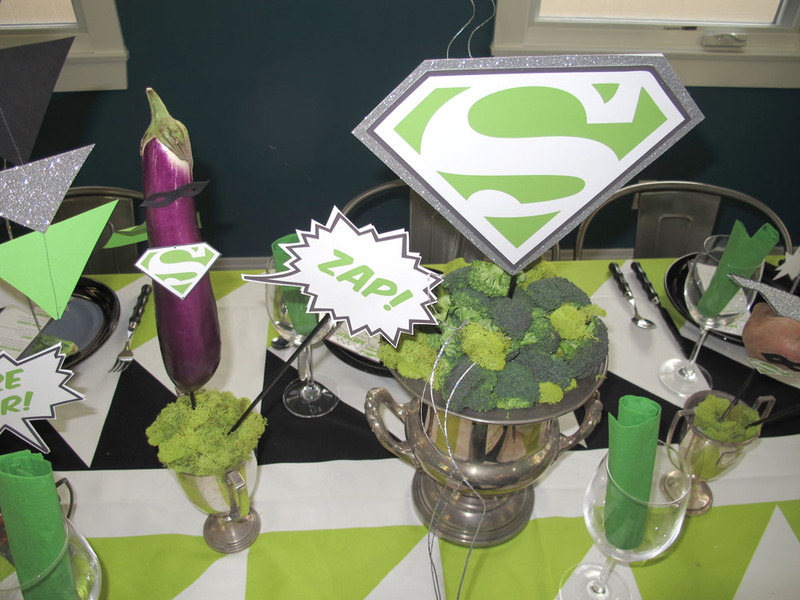 This is a “Superfood” themed dinner we hosted for our supper club (Also known as Gourmet Group.) After about 2 years of dinners, we had pretty much retired every country-specific theme between our group of 7 couples. 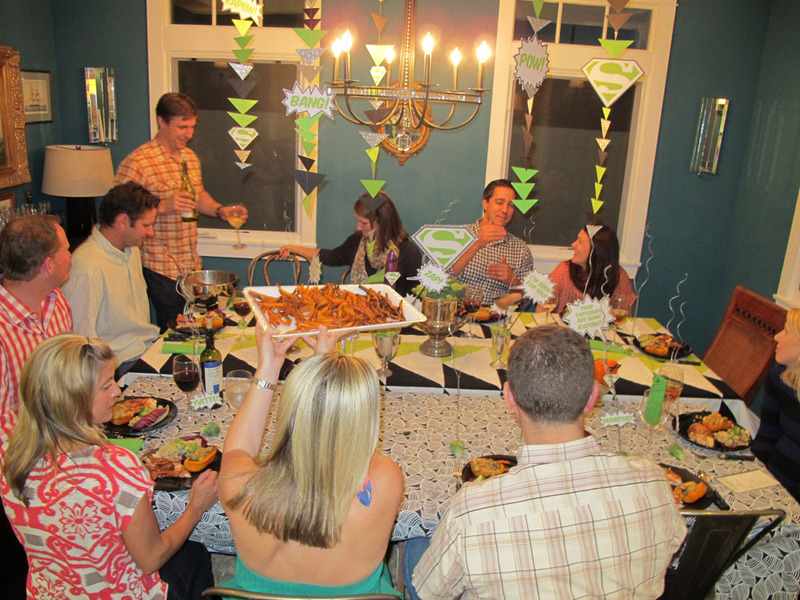 My huz and I also hosted what was arguably the most gut-busting dinner known to man last year (our Mexican Fiesta!) and we didn’t want to roll groaning people out of our house on dollies after dinner this time. 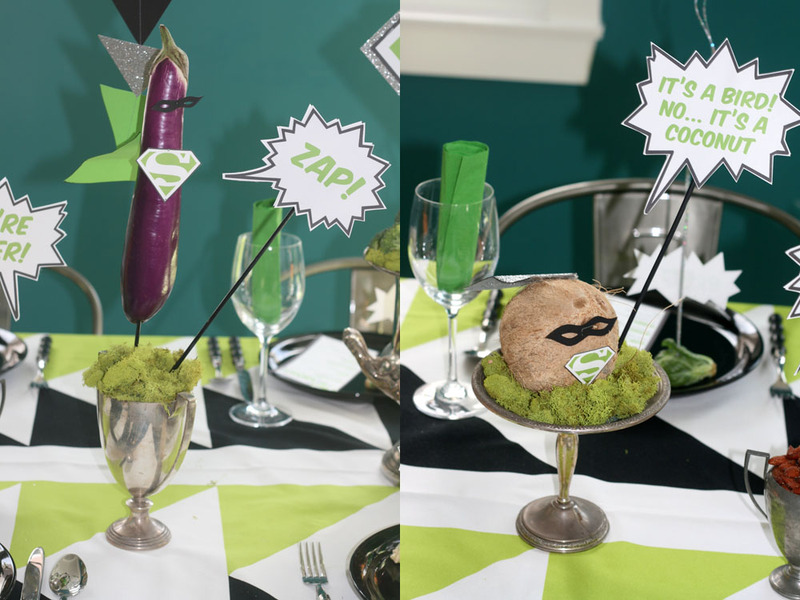 So we cleaned up the menu with the intention of cleaning up our innards and went with a Superfood theme. 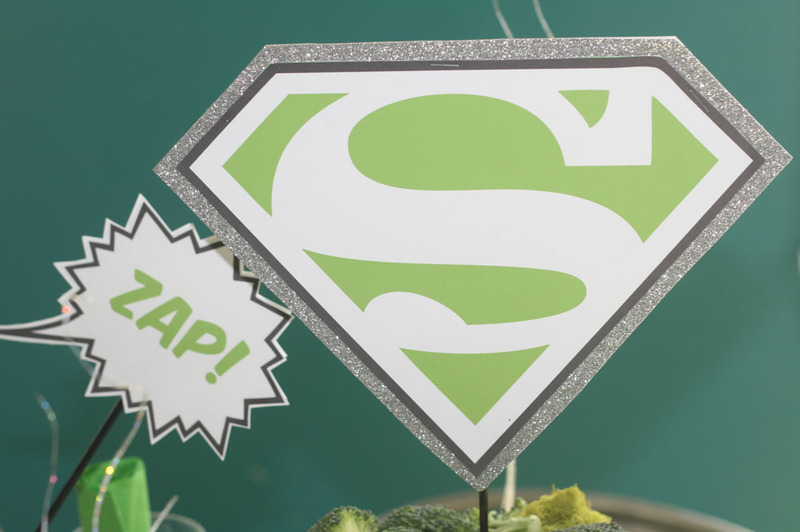 As soon as we chose this theme, I could not get the idea of caped super-veggies out of my mind. 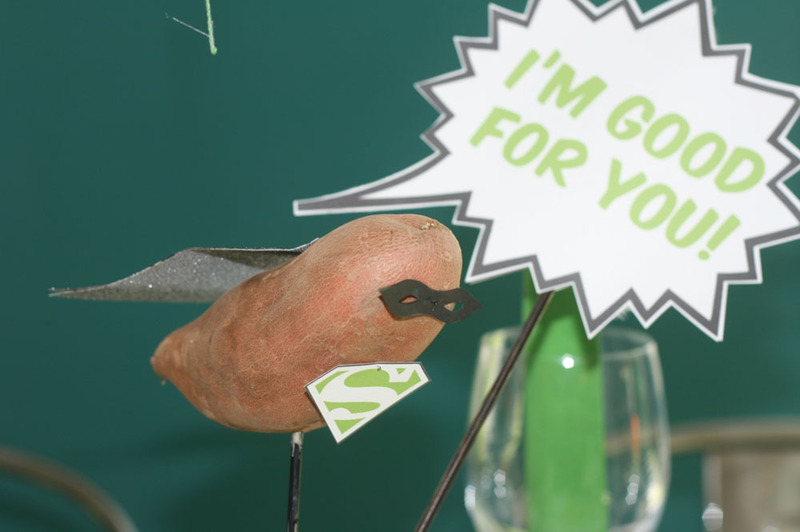 “Super Sweet Potato to the rescue!” A caped coconut, eye-masked eggplant, powerful pepper, brawny broccoli, and awesome almonds became the super centerpieces. I completely felt insane while dressing these veggies… having thoughts like “Oh, your cape needs a little more wind behind it!” and “Let’s just adjust that eye-mask a titch!” Then I thought to myself, that there are people who probably do this FOR REALS in a dark shed and talk to them like they are friends… It made me feel better to know that on the grand scheme of things, I am only tipping the crazy scale a touch in comparison. 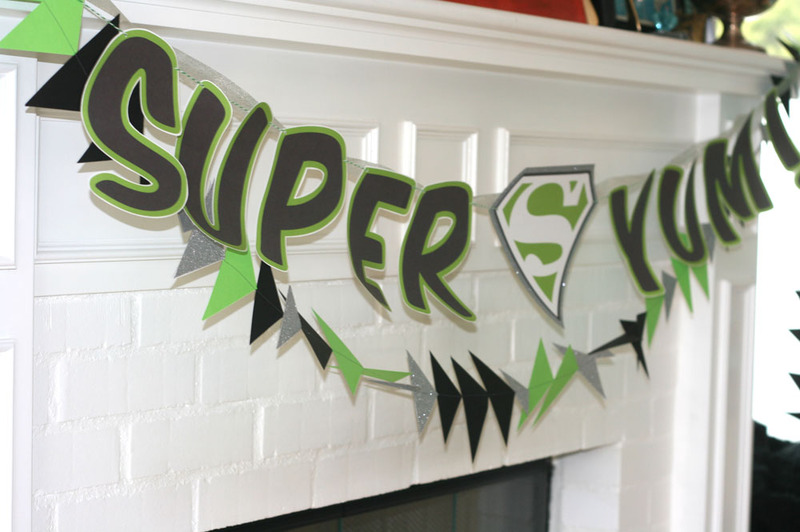 Stealing my mom’s trophy collection once again – since what’s more ‘super’ than a trophy? 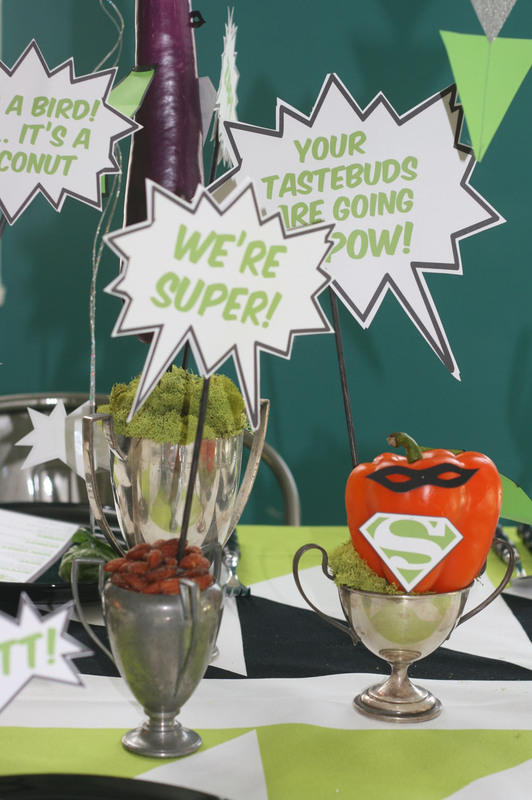 – the superheroes flew high above the tables ready to save our stomachs from processed food. Aren’t they cute? It was hard to disrobe them. 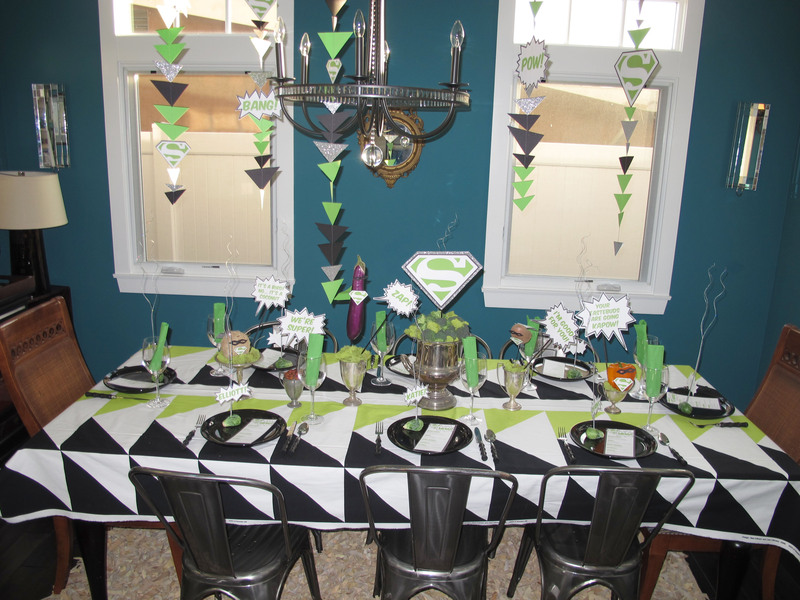 Mimicking the pattern on the tablecloth (fabric from Ikea), I sewed triangular garlands to hang from the ceiling. The silver paper added such a big punch and kept it from looking too flat. I’m no perfectionist, so the triangles were cut freehand and sewn up quickly. No real plan… I don’t think this stuff is worth fussing over too much! The impact is there and no one will notice your imperfect stitches! 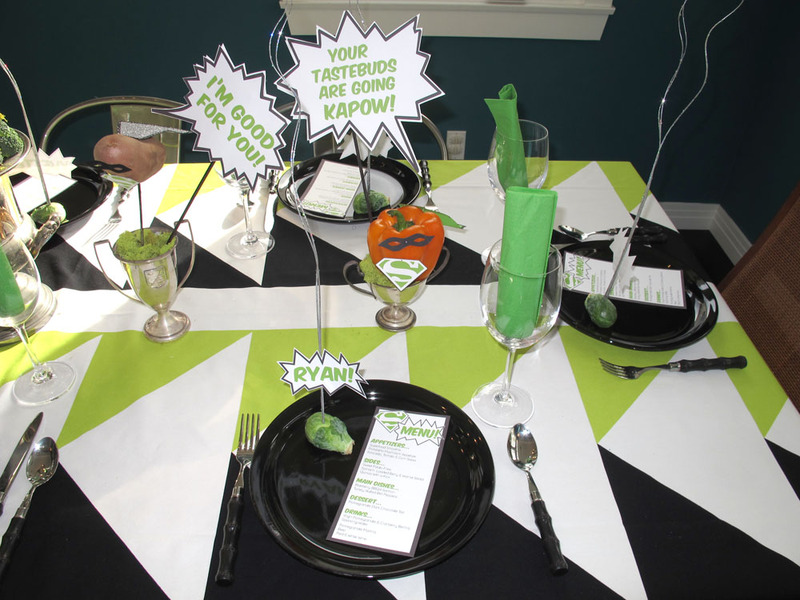 For place settings, we used black plates, black bamboo weapons, placed the napkin in a wine glass, printed out a menu, and popped a seating card in a brussels sprout. 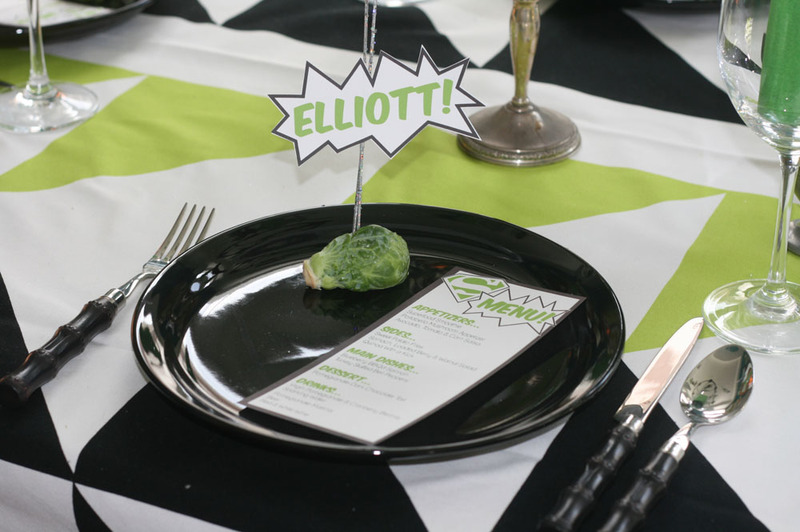 On the subject of place cards… do these give anyone else anxiety? I’ve never been a huge fan of them, though I LOVE how they look. I just could never decide if they are stuffy or cool. Mostly, I never want anyone to think “Oh GOD! Why did she put me next to that dishrag?” (not that I know any dishrags!) or “Oh she must like me best because she’s sitting next to me!” I’ve always been more free flow about seating… until this party. What we decided to do was wait until most of the people got there, then we played “Seating Roulette.” Note: This may only work with people who actually know/like each other – I wouldn’t try this with a mixed group right off the bat! 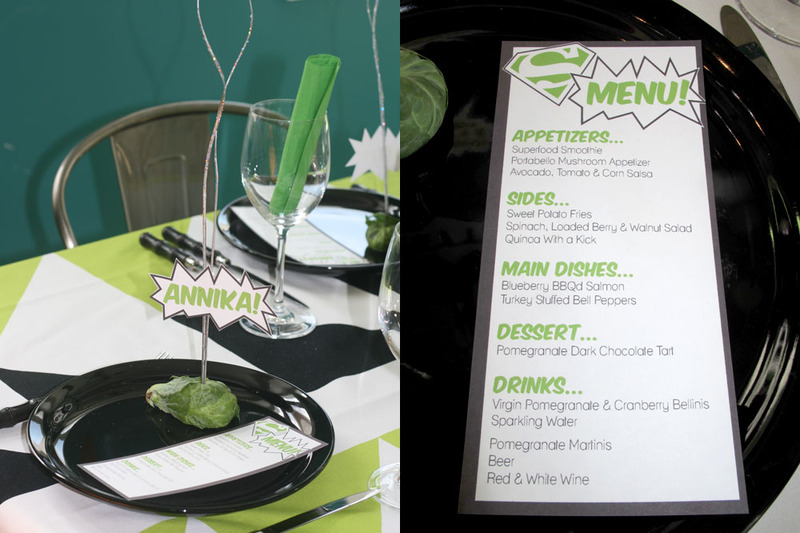 In everyone’s presence, I turned all the place cards upside down, mixed them up, then walked around and put them into the brussels sprout. The only rule was that you couldn’t sit next to your other half. Everyone knew how random it was – which took the dishrag pressure off of me! – and I think it really mixed up the conversation in a fun way. It turned out to a be such a fun and delicious night! 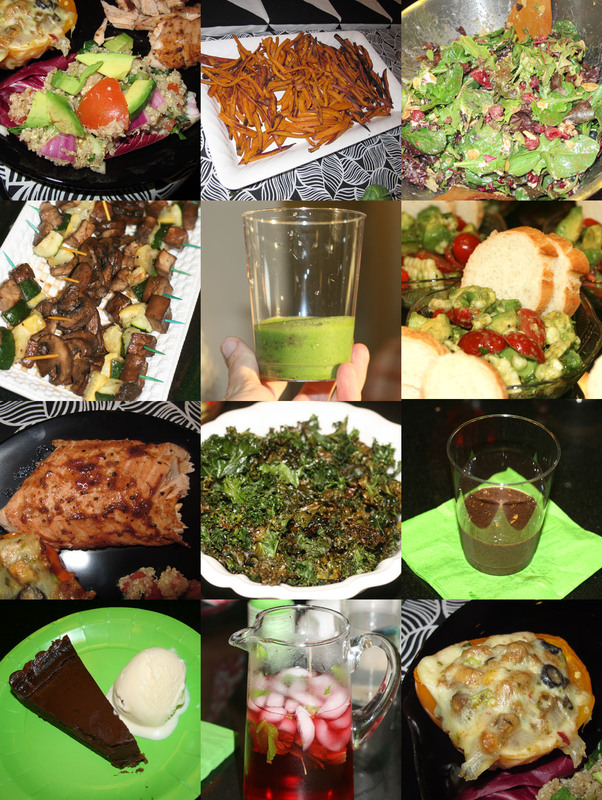 Look at all the food we devoured… And everyone left on foot! No wheelbarrows necessary! It really was “Super Yum!” But full disclosure here. 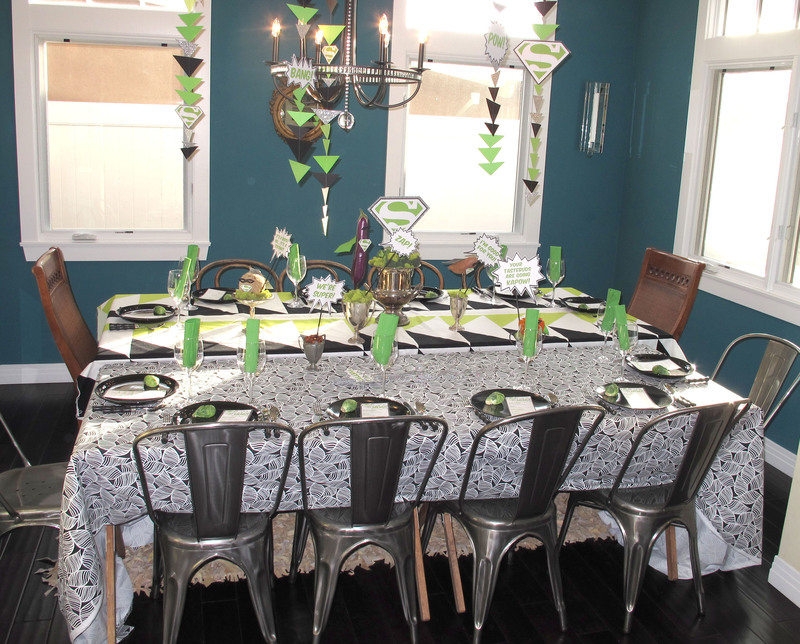 The table really looked like this: We had to add an extra table since there are so many of us. Shhh! Let’s eat! 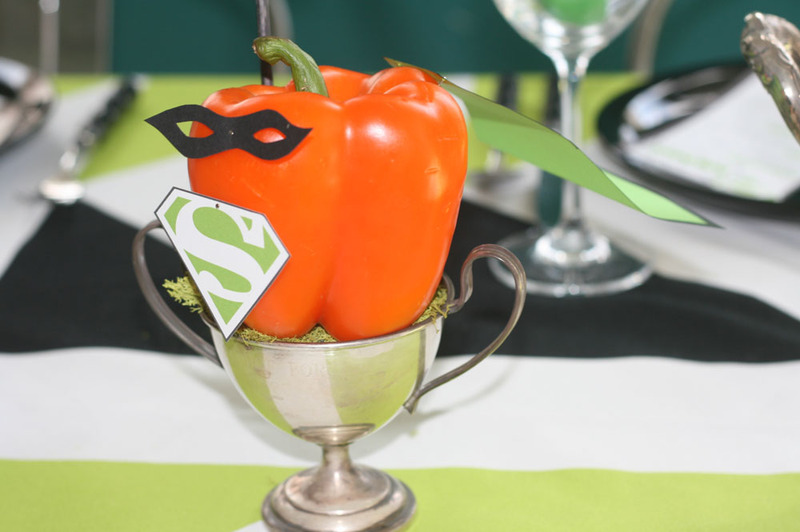 Super Pepper signing off! Hope you all have a SUPER day! As always, thanks for reading! 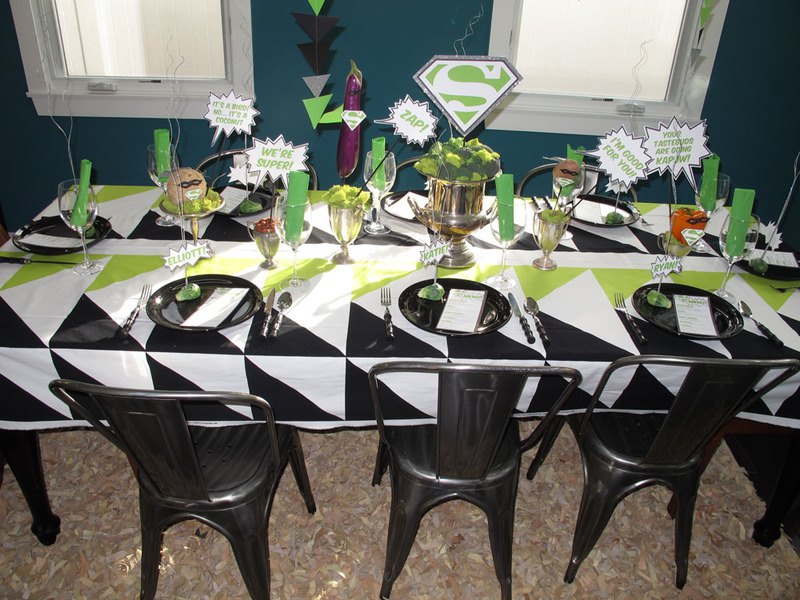 This entry was posted in supper club and tagged black and green party, dinner party, gourmet dinner party, hero party, ikea fabric, place settings, super hero theme, super party, superfood, superfood menu, superfood party, superhero party, supper club, triangle garland by Annika. Bookmark the permalink. I mean…..!!!!!! This is FANTASTIC! Everything about it! LOVE it! 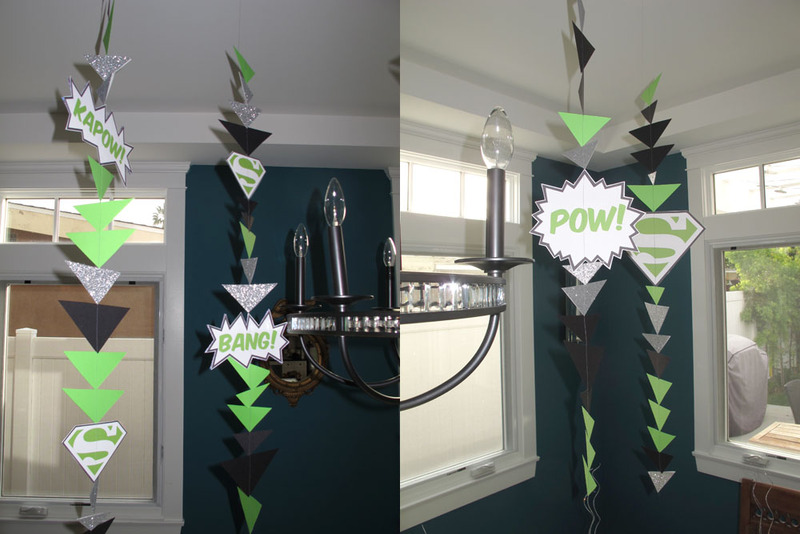 this is super-creative and oh-so-fabulous! 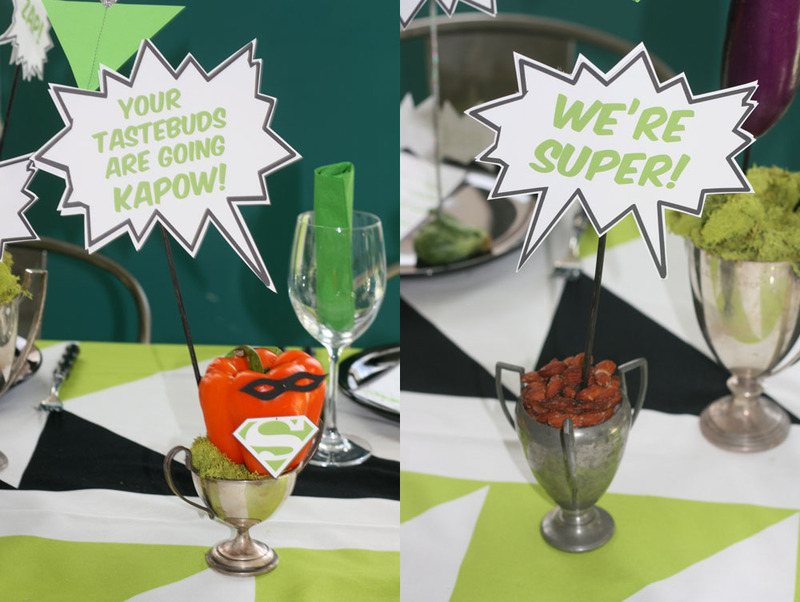 love the superhero veggies with capes and masks and adore those brussel sprout place cards!! awesome detail! Best use for Brussel sprouts ever!! Loved it! HOLY COW! 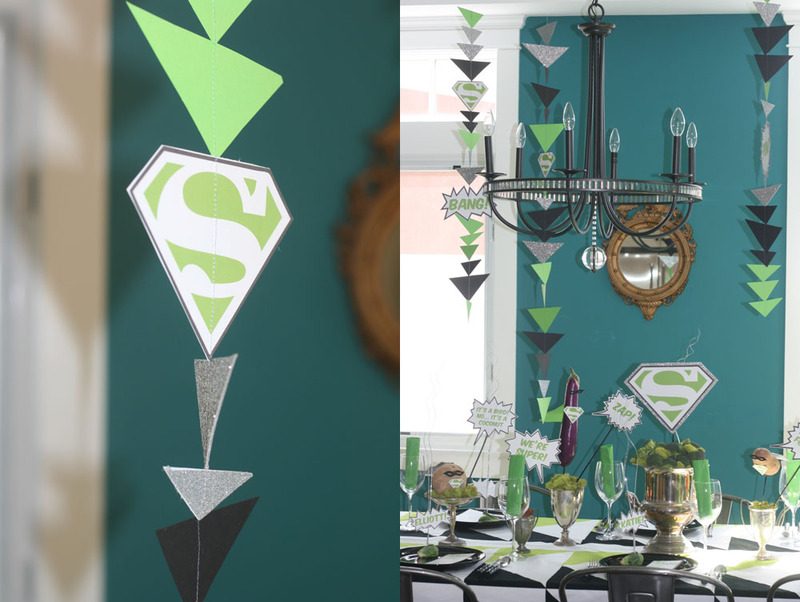 THIS IS SUPER! I love it! How stinkin fun! I love the “it’s a bird. no, it’s a coconut” Food in capes and masks? AWESOME! Great idea! 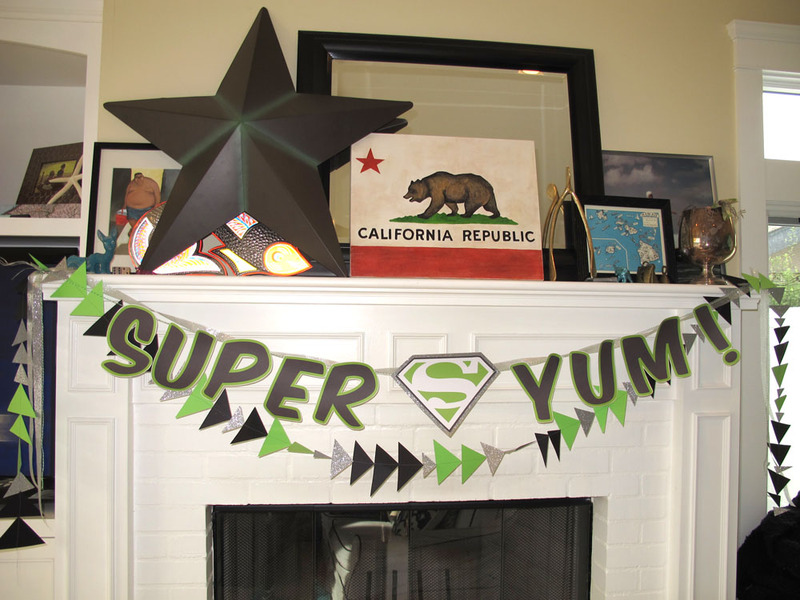 Dying over that triangular garland! I am so lazy that I never want to pull my sewing machine out, but I might now. It looks super modern and cool. Love. It. This is the cutest. 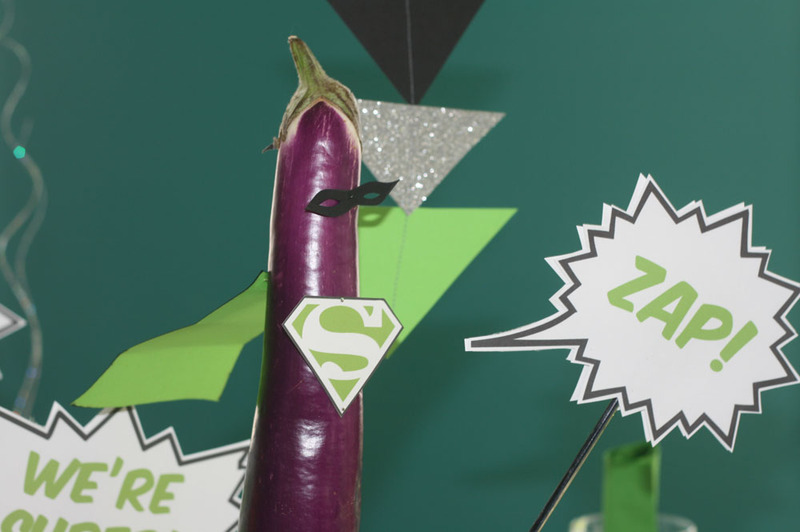 I love the theme and the super-veggies. Awesome, A!